Discover the 💯 toolings and learnings from creating a production ready modern API, made on 🌎 by & for humans! How tall is a rocket? How many launches have already successfully landed-back?, What’s the maximum crew capacity of a capsule? If you did so, I might have great news for you! Discover all the interesting details about capsules, cores, landpads, launches, missions, payloads, rockets, ships & much more. You could even check if Elon’s 🚗 Roadster has finally arrived to Mars! During the traditional 2018 🎄Christmas dinner, I was having a talk with my physics fanatic uncle about the work I was doing with the SpaceX API (he had never hear about what’s an API, but he does like rocket stuff so was willing to listen), I picked up my 💻, opened the browser and with a few button presses, we got all the SpaceX rocket’s name, description & engine details, he was surprised of how easy it was (now you could even do it with your📱, it’s just mind blowing). After that, yep, I lost my laptop for the next hour 😂, he knows a lot about thrusters & such, thus, he started to explore the API meanwhile I was playing with the little ones. At some point, he fetched some launches images and genuinely, my 5yo cousin asked if I was inside of that 🚀 (I love those kiddo’s life perspective, they do believe anything is possible). By then, it had already happened, thanks to such accessible technology & their incredible features, we, the three of us, spent part of the evening just being amazed about rocket missions, capsules & other SpaceX data! Moral: Let’s build accessible software to keep motivating people passions & dreams! P.S. : The little one already know more about SpaceX than me (as he was playing around with the API during all this month). I’m so 😃 just because of the fact he’s curious to learn. When I found it, I was really excited to look into the available data but… within a few minutes I was already dealing with versions, docs & 3rd party SWs, basically, I gave up then I decided to start the migration! In this post you’d find in detail the main reasons about why it happened. 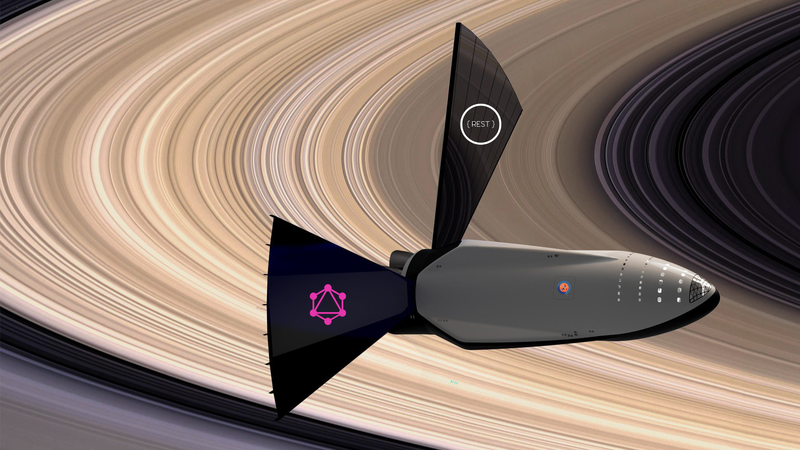 Tons of articles have been written by experts about the pros/cons of GraphQL & REST APIs. I’m not going to repeat those here but I’d totally encourage you to research about it, you could also check the GraphQL official website to get introduced to it main features! ⚫️ It follows the Schema-First approach using a domain modular schema structure. It contains the data collection type definitions modularized by concerns. Functions responsible for fetching & filtering the desired data. 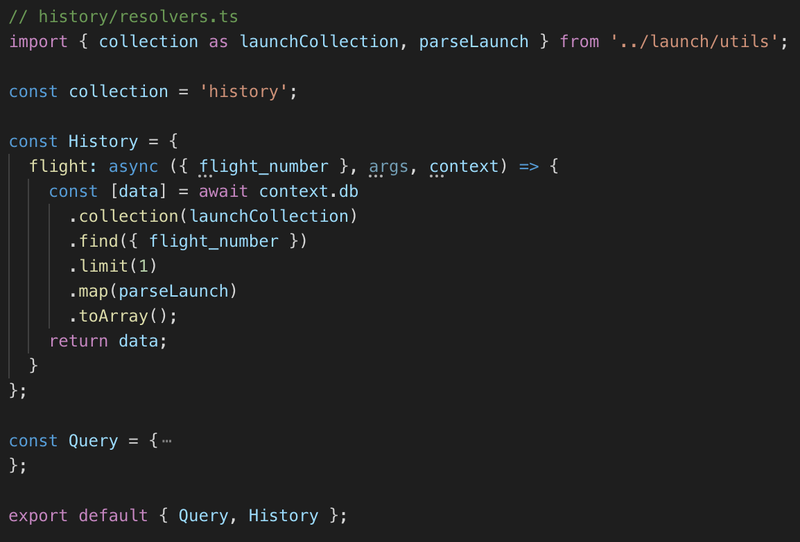 Composed by parse functions or any operation that the returned data could need! 💡 Break your schema by concern, not by types! ⚫️ It provides Type-Safety auto generating typeDefs & resolvers TypeScript types. Having our GraphQL schema as Single Source of Truth, we might want to auto-generate all our types in order to keep the data structures in sync over the whole application. Here is where the GraphQL Code Generator (created by Dotan Simha) comes in! 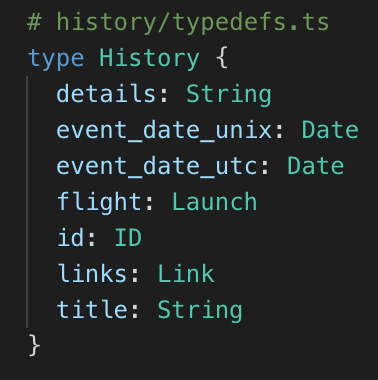 ⚙️ It generates all the typeDefs & resolver functions (including args & returned data) TypeScript types. Don’t miss the following post if you’d like to more about it implementation & benefits! ⚫️ It’s protected from infinite & complex requests providing custom error messages. Thinking in GraphQL as a huge endpoint where all the data is available, not having the right protections might cause vulnerabilities such as being affected by DoS (Denial of Service) attacks. If you’re interested on securing your GraphQL API, don’t miss this Max Stoiber article where it gives a 💯 overview about the main problems & its respective solutions! All the data from these platforms is parsed & collected in a public Mongo database from where the information is obtained. This incredible work was done by the most popular non official SpaceX REST API (which is running already for 2 years). I wanna give them a great shout-out for such a work giving us the capabilities to access all this interesting data. I’d totally encourage you to help them proposing new features or fixing existing bugs, they’ll definitely appreciate it! You might want to take a 👀 at the codebase where you’ll find all the implementation about the mentioned topics, here it is! What if you don’t wanna use GraphQL? That’s fair, but… What if you could generate a REST API based on your GraphQL implementation to get all the benefits from both worlds? 🤔, does it even make sense? 🔘 Fully up-to-date generated documentation. 🔘 Runtime data validation ensuring type-safety. 🔘 No more painful versioning. 🔘 Forget write manually routes & controllers. Now, this is possible 🤯 , just Rest with Sofa (Kamil Kisiela’s invention) auto-generating a REST API based on your GraphQL schema! If you’re a REST API fan, you can fetch the data exposed through the documented endpoints. In addition you’ll be able to get all the mentioned benefits from GraphQL, such as, up-to-date typed Docs! Although, if you’re looking for performance, I’d recommend you use the existing REST API! If you’ve already implemented a GraphQL API, within a few minutes you could also have a REST one, check how you could implemented it! 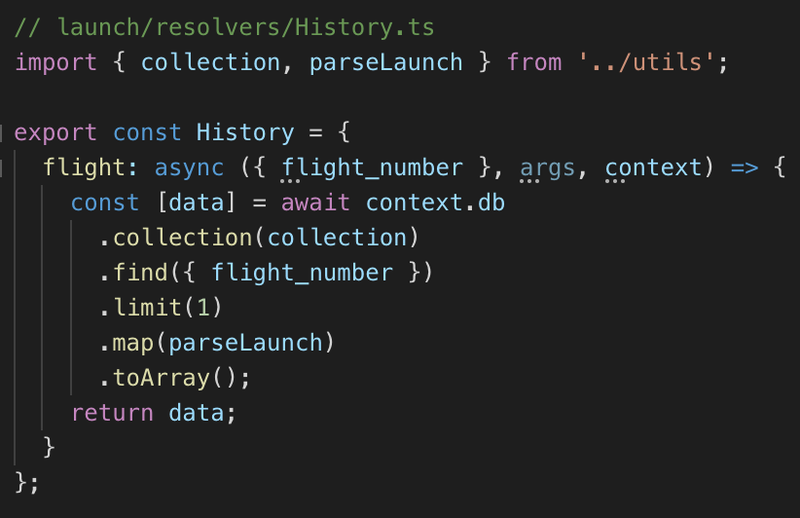 ⚪️ Use ‘express’ and share your schema (composed by typeDefs & resolvers), as well as your context over the servers! ⚪️ Use sofa & OpenAPI in order to generate a REST API based on your GraphQL implementation. You might also wanna use ‘swagger-ui-express’ to serve the docs! ⚪️ Use ‘apollo-server-express’ & apply the ‘app’ express instance to the GraphQL server! That’s it! GraphQL💜 REST, stop arguing & take advantage from both worlds! There’re still a lot of work to do, starting from error handling, testing, etc… I’d love to receive any proposal/issue in order to improve the existing! Also I’d animate you to contribute with all the mentioned technologies, they’ve already done such an incredible work but I’m pretty sure that they’d appreciate some help! It was never easier to create & share 💯 web application projects using your favs FE libraries, thanks to Codesanbox Ives van Hoorne’s creation. Whether you’re starting with GraphQL or not, give a 👀 at the differents live examples, you could discover interesting ways of use! Learn how to interact with a GraphQL API using TypeScript within a MVVM architecture. Pick whichever programming language & FE library you feel confident with, schedule some ⏳ in your calendar & enjoy coding 👌 webapps! If Elon couldn’t convince you, do it for them, the OSS community will really appreciate your work! 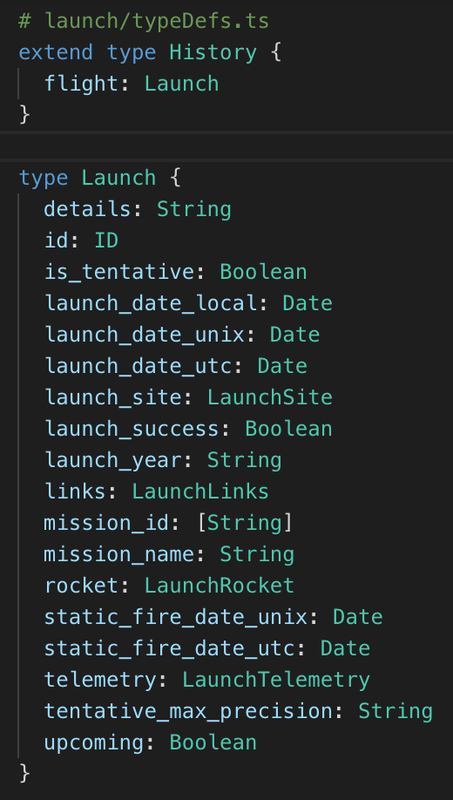 Anyways I’ve got great plans for every single SpaceX CodeSandbox created, in special for the 💡 ones, help me out with that! First I want to encourage anybody to begin writing blog posts, you’re totally capable to do that 💪, I’ve just started a couple months ago (I don’t even write a proper English) and I cannot be happier about it, you’ll get better, it’s just matter of time. Share whatever you 💜, people will learn, like & thank it! If you’re a GraphQL enthusiast as I am, I’d definitely recommend post on Open GraphQL. It’s a publication open to anything & everything GraphQL related runned by Nader Dabit, message him!, surely he’ll be willing to have you on board! Also, I’d want to give a shout-out to The Guild Urigo’s foundation for supporting the GraphQL community with tooling like GraphQL Code Generator, 😉 sofa, GraphQL Modules & GraphQL Inspector among others, it really changes the DX! We are approaching our next destination 🌖, stay tuned not to miss the landing!